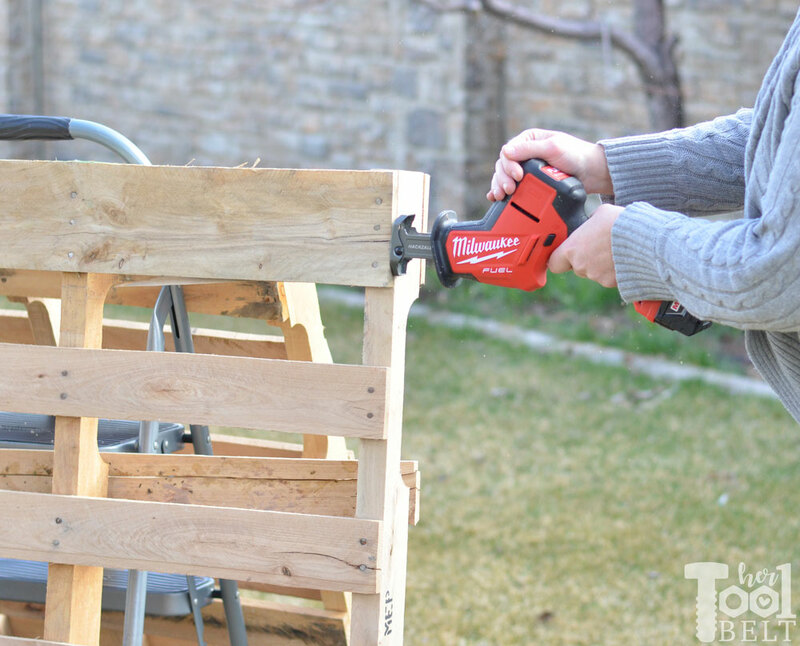 This How to take apart pallets easy with a hackzall tool review is sponsored by The Home Depot. I have been compensated for my time and provided with product. All ideas and opinions are my own. This post contains some affiliate links for your convenience. Click here to read my full disclosure policy. 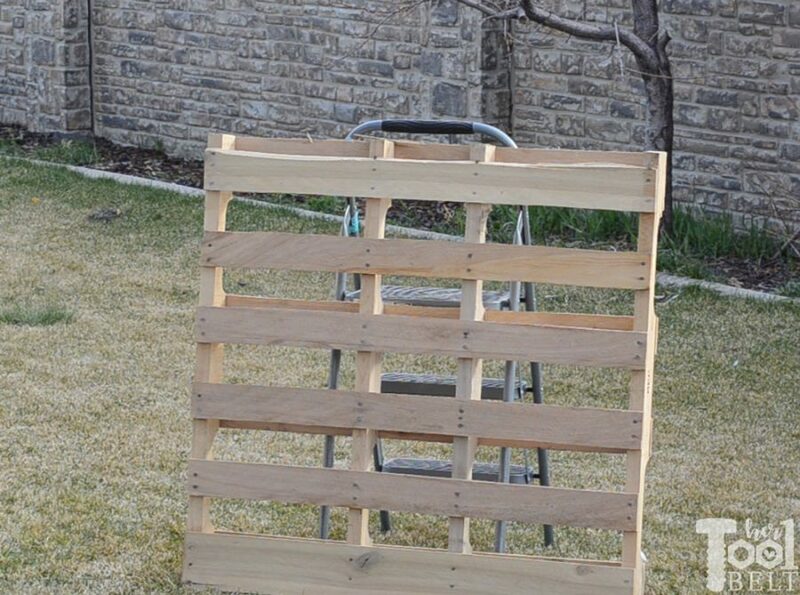 I like to use free pallets for outdoor projects when I can. Often times outdoor projects don’t last more than a few years. Generally pallets already have that rustic feel, and if the project deteriorates, I won’t feel bad since the wood was free or cheap. Then it’s a good excuse to build something new! I’m working on taking apart some pallets to build a new pallet planter box, one of my favorite projects. When I take apart pallets, I really like to slice through the nails. This way I keep the rustic look of the nail holes in the pallet slats and the boards come off pretty clean. Something to prop up the pallet, a stool, another pallet, a wall, etc. 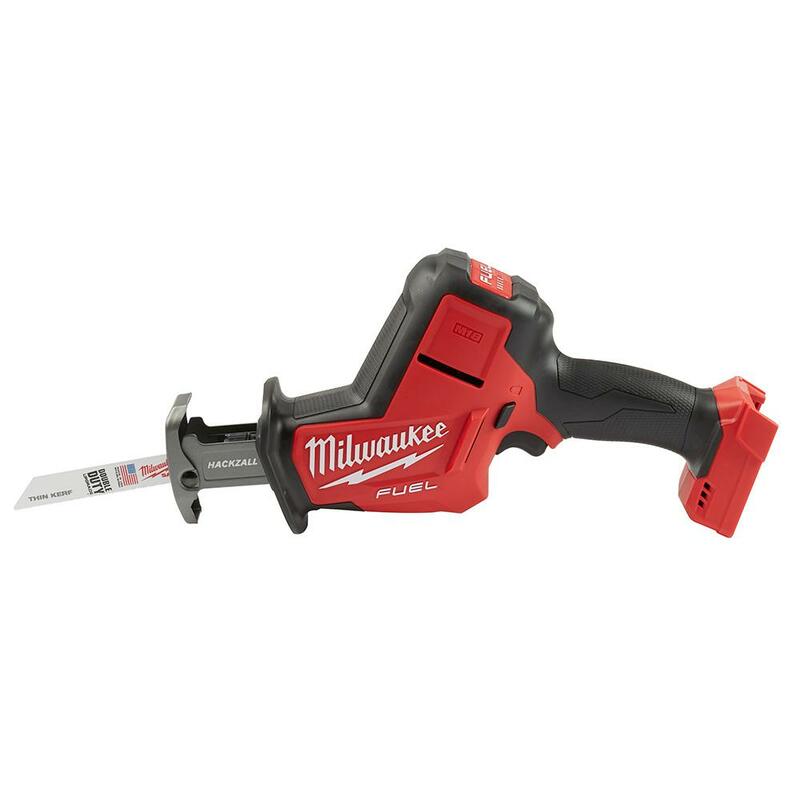 I’ve been using this Milwaukee Hackzall to dismantle pallets, and I really like the design. The hackzall has a different look and design than the traditional reciprocating saw. That is because it is designed to be used one handed! This is my favorite features, because it’s always nice to have another hand to hold something else. The Hackzall also has dual gear counter balance mechanism that provides low vibration and reduces user fatigue. It’s also cordless running off M18 batteries and has a brushless motor that helps it cut fast. Of course a good blade helps with that too. I find it most comfortable to prop the pallet up. It’s more comfortable for me than laying the pallet down and cutting it. It really helps if your pallets are a little loose. 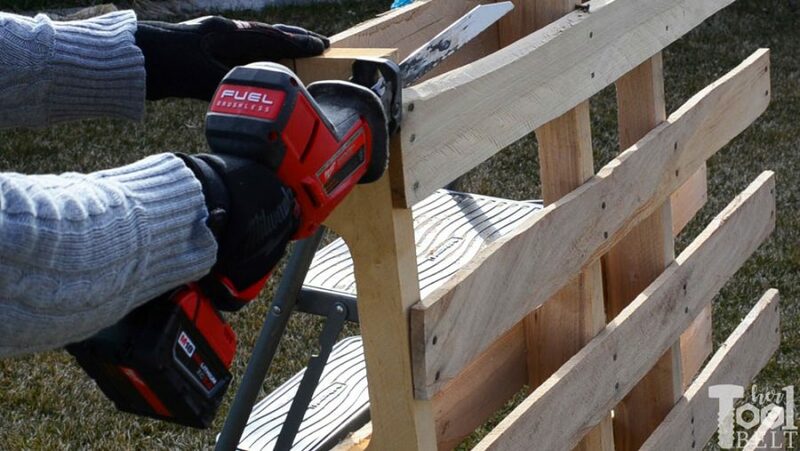 Slide the saw blade between the pallet slat and rail then place the shoe of the saw up against the wood. Then slice through the nails down each side of the pallet. The outside nails are the easiest to cut, but things can get tricky with the center nails. Plunge the reciprocating saw down and place the shoe on the rail. I find it easiest to continue to pivot the saw down, pressing on the shoe until I cut through the nails. In no time, you’ll have pallets nicely dismantled. Now time to build my pallet planter box. 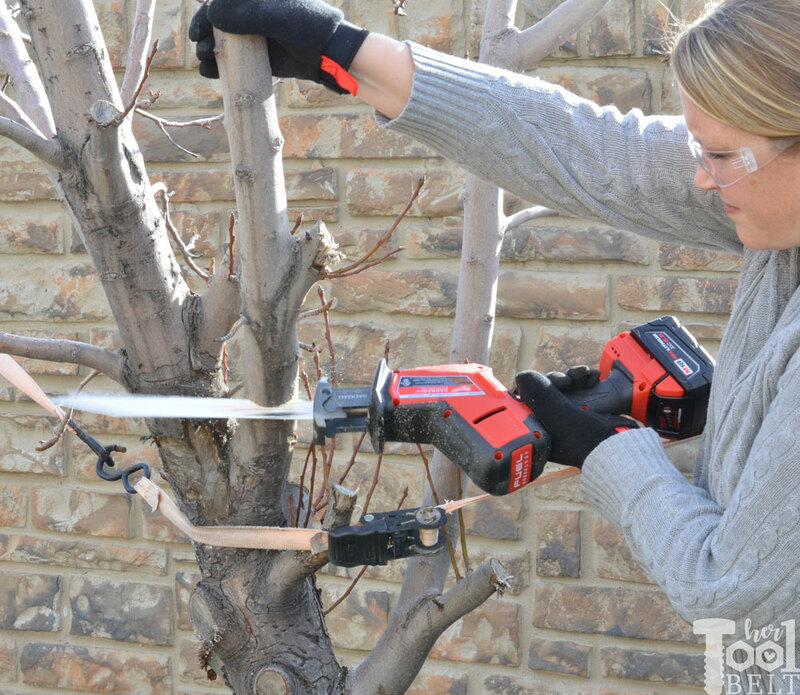 I also love to use the hackzall and wrecker blade to prune trees around the yard. It is nice to have the extra hand to hold the branch while cutting.